An Arts and Crafts Glasgow School oak settle in the style of M H Baillie Scott. Made by Wylie and Lochhead with sweeping curvaceous ends and a lower slatted detail, retaining it抯 original fabric with fantastic stylized Glasgow Roses which I must say is also in wonderful original condition with minimal fading. The back has been re webbed by the last owners to support the fabric better and it is open for all to see. H 53", W 76", D17"
Wylie and Lochhead. A good Glasgow School oak settle in the manner of M H Baillie Scott, with chequered inlay to the forward uprights. Height 51", Depth 23" Width 48.5". 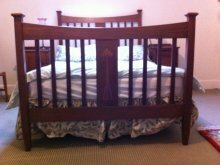 A top quality Glasgow School Arts and Crafts oak bedroom pair with 3/4 wardrobe and 4' 6" double bed. Wardrobe with flaring cornice, full length mirror door flanked by stylised floral inlays and lower full length drawer with good quality stylised handles. Probably made by Wylie and Lochhead. Wardrobe Height 80", Width of Cornice 57", Depth of cornice 22 1/2". Circa 1900. Wylie & Lochhead. 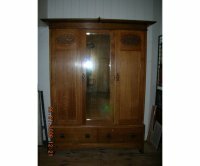 An Arts & Crafts oak wardrobe with iron hinges and latch style handles to the doors which open to reveal twin hanging space, with two deep drawers below. Height 79.5" , Width 60.5" , Depth 19.75". The Butterfly chair designed by E.A.Taylor and made by Wylie and Lochhead for the 1901 Pavillion Exhibition. An important documented work of Art with Mother of Pearl and Walnut inlaid Butterflies and stylised flower heads. Mackay Hugh Baillie Scott (1865-1945), an oak back wing armchair upholstered in blue cut damask, the arm supports with chequered inlay panels, block feet. There are two armchairs identical to this one by M. H. Baillie Scott shown in 'Houses and Gardens', p. 298 and 299 in period pictures of a house Baillie Scott designed called, 'The Garth'. 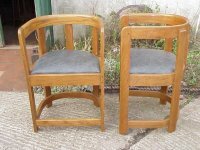 A pair of good quality reproduction Charles Rennie Mackintosh Ingram Street tea room chairs in light stained Oak. height 41.5" width at front of chair 19" depth 17". An Arts and Crafts Glasgow Style oak dining table by Wylie and Lochhead with square and turned legsunited by side stretchers. Width 39", Length 54". Circa 1900. 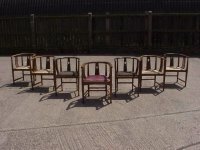 A pair of Glasgow style armchairs and a single chair available. 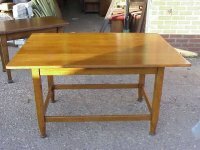 RC 2 - Craftsman built replica Ernest Gimson style Cotswold School dining table with butterfly joints to the top and treble end stretchers united by a full length double stretcher with through tennon details. Length 8' Width 38". LAST ONE SALE PRICE �00. The table can be found under Replica and Reproduction pages at the bottom of the index list. Attributed to EA Taylor and made by Wylie and Lochhead. All the above are now sold but I do have one in stock at the moment which has twin stretchers to the sides and back which is the best one of this style I have had, professionally re upholstered in quality burgandy hide. I do come across these from time to time, please send me an e-mail with your requirements. Waring and Gillows. 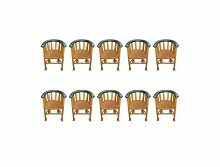 Ten Arts and Crafts oak tub chairs with shaped solid seats and striking semi-circular stretchers. Two chairs have been dismantled, joints cleaned, re-glued, cleaned and re-finished and the upholstery to the arms have now been professionally re-upholstered in a quality Hide. Original metal Waring and Gillows labels to underside of one. A pair of Scottish School armchairs of barrell form with steam bent back rest and stretchers. professionally Re-upholstered in a quality Turquoise leather. 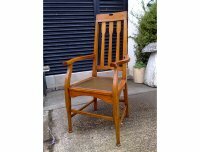 A good quality oak armchair made by Goodhall, Lambs and Heighway of Manchester (stamped under seat rail). Sweetly stylised carved back spat. 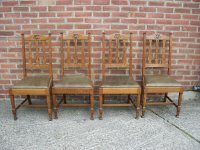 A quality set of four Arts and Crafts dining chairs by Shapland and Petter im the manner of M H Ballie Scott with wonderful stylised floral carved head rail and back splats, the front legs with gentle 'in and out' curving to all 4 facets, shaped block detail where the stretcher meet's making the front joint much stronger than conventional design's proving yet again that Shapland and Petter where far ahead of their rivals and at the forfront of technology and manufacture in the mass production of Arts and Crafts furniture in Gt Britain in this period. Professionally re-upholstered in a quality green hide. 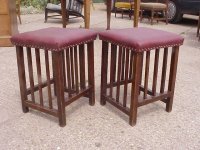 A Pair of Arts and Crafts Glasgow School stools with slatted sides probably made by Wylie and Lochhead. Height 18 1/2", Width 16 1/2", Depth 11 1/2". C1900. A superb Glasgow School, enamel white painted folding screen with wonderful leaded glass top. Silver Studio fabric, somewhat perished which would need to be replaced, the best of the original fabric could be rescued and framed. Screen and Glass design attributed to EATaylor probably made by Wylie and Lochhead and retailed by LandCo. Height 75 1/2", Width 51 1/2". Circa 1900. A superb quality Arts and Crafts Glasgow Style oak dressing table attributed to Gillows with wonderful chequered string inlay. Height 57 1/2", Depth 18 1/2", Width 36". Circa 1900. 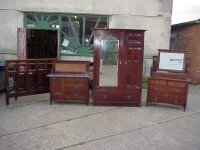 A fabulous 4 piece bedroom suite of superior quality by Wylie and Lochhead the design attributed to E A Taylor consisting of double wardrobe, Dressing table, Wash stand and 4' 6" double bed. Fantastic metal work thoughout, original brass candle caps to the DT, Celtic cutouts to the DT and WS, elongated hearts to the bed, wonderful conforming cornices all with dental detailing. It is very difficult to find bedroom suites which still have their beds. Wardrobe Height 75", Depth of cornice 21", Width of cornice 53 1/2", Dressing table Height 57", Depth 20", Width 42", Washstand Height 43", Depth 20", Width 50". Circa 1900. A Glasgow School tub chair with the most incrediable inlaid back panel of a Glasgow School Maiden and a windmill and Galleon to the inner sides it is inlaid with Fruitwoods, Mother of Pearl and Abalone with artist painting and detailing to a very high quality. A very pure design. 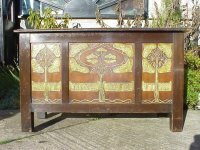 A stunning Arts and Crafts stained wood and Gesso cabinet designed by Edwin B. Joliffe which won a competition at the Liverpool School of Art in 1899/1900 with superb Glasgow stylised floral Gesso and Burlap details, the motto reads:- 'SAFE BIND SAFE FIND', Stunning unique piece of exhibition quality. This actual piece is illustrated in the Studio Year book volume 19 page 133 image attached and an image of a wall cabinet which is also by Joliffe. Height 29', Width 47 1/2", Depth 20 1/2". Circa 1899/1900. 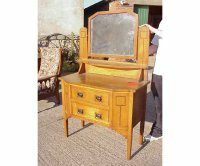 A rare pair of oak bedside cupboards in the Glasgow Style with bevelled mirror backs, sweeping slatted sides and tiled tops with cupboard below and open lower shelf on square tapering legs. A Glasgow School treble wardrobe attributed to E A Taylor, made by Wylie and Lochhead. sweeping arched base with twin heart cut-outs, detail of the sweep is just set back as if carved in and really quite subtle with corresponding upturned detail to the lower centre emulating the top centre cornice detail, the whole wardrobe is on flat feet with lower arched details to the sides, copper handles with repousse hearts to the back plates. Height 7' 3/4", Depth 22 1/2", Width 5' 7". Circa 1900. A Scottish School armchair attributed to Punnet and made by William Birch of barrel form with semi-circular arm and backrest with wide shaped top central splat identicle to the more common Birch dining chairs with drop in rush seat and gentle sweeping curves below on straight legs. 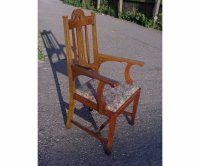 A Glasgow style Arts and Crafts oak armchair with leather head rest 3 central slats leather sprung seat and ying-Yang cut-outs throughout. 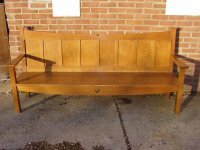 An excellent Wylie and Lochhead Oak Arts and Crafts bench attributed to EA Taylor, with gentle curved top with restrained stylised cut out to top typical of Taylor and gentle curve under seat with heart cut out, flaring arms, finished and fielded paneled back so this bench was originally designed not to go against a wall. An interesting Arts and Crafts stool in the Glasgow style with exposed peg construction. Height 18", Length 18", Depth 12". C1900. 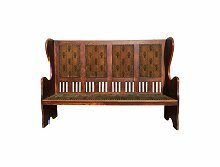 Exceptional Oak Arts and Crafts Settle the design attributed to E.A.Taylor and made by Wylie and Lochhead. Length 37", Depth 18", Height 46", Circa 1895. 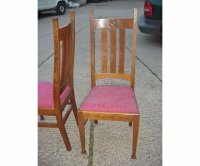 A pair of Arts and Crafts oak chairs by E A Taylor, made by Wylie and Lochhead with crisply carved Glasgow roses to the head rests, shaped slatted backs tapering legs united by three high stretchers. A superb Glasgow School oak folding firescreen with wonderful stylised floral needlepoint. Height 31", Width open fully 22". Circa 1900.